Image credit: © Frank Vassen at Flickr. Some rights reserved. Pelage: Dark brown or black fur, tipped in white. Tail monochromatic, long and bushy. Range: Madagascar. Concentrated in eastern, northern, and central-western regions; fragmented pockets in nearly all coastal areas. Habitat: Forest inhabitants; found in nearly all forest types excepting the spiny forest (historically home to the extinct giant aye-aye). Inhabit cultivated areas. Endangered (2012 assessment) (Andriaholinirina N. et al. 2014) Large scale reduction in habitat linked to population declines. Population contraction of > 50% expected within 10-24 years. Population in Wild: Unknown. Elusive, nocturnal behavior hinders studies of population size and dynamics. Locomotion: Walk, run, climb, and leap. Most often move within the forest canopy, though commonly observed on the ground . Activity Cycle: Nocturnal. Feed and travel at night; by day, rest in nests located in trees. Social Groups: Solitary most often. Diet: Omnivores. Seeds, nectar, cankers, and insect larvae compose 90% of the diet. Predators: Humans believed responsible for most mortality. Fossa. Snakes and raptors may prey on infants and young. Nocturnal lemur, native to Madagascar. ​Specialized teeth, fingers, and ears help individuals forage for food. ​Continually growing incisors (teeth) gouge seeds, scrape fungus and cankers, and pry bark from trees. Wood-boring insects are also a large part of the diet. Subsurface hollows, which often contain larvae, are located by echolocation using a technique known as percussive foraging. An elongate, highly flexible middle finger taps on bark, while large ears are cupped around the area to detect resonant sounds. © 2014-2018 San Diego Zoo Global. Updated November 2014. Population status updated 2018. 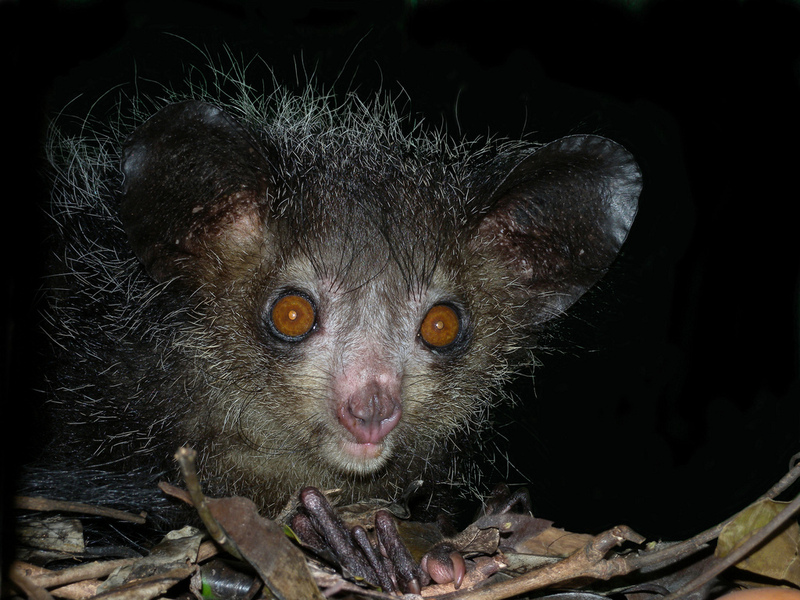 How to cite: Aye-aye (Daubentonia madagascariensis) Fact Sheet. c2014-2018. San Diego (CA): San Diego Zoo Global; [accessed YYYY Mmm dd]. http://ielc.libguides.com/sdzg/factsheets/ ayeaye.